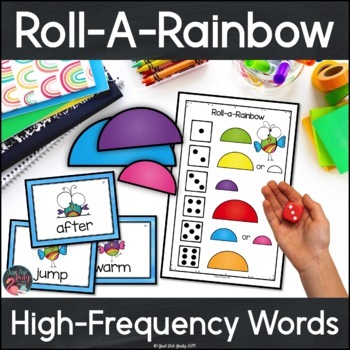 Use this engaging rainbow themed activity to give your kindergarten, first, and second-grade students practice reading high frequency words. All 220 pre-primer, primer, first, second, and third grade words from a popular list along with the remaining words from the 300 most commonly used words list are included. There are a total of 355 word cards (9 per page). Choose words to meet the needs of your students. 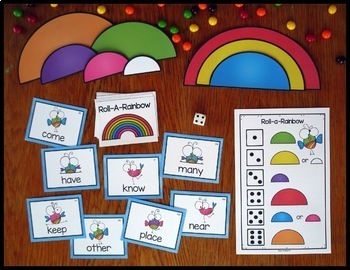 This activity is perfect for small instructional groups or as an independent center. 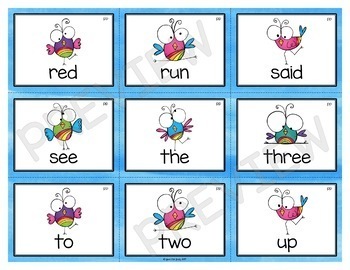 It’s a great activity for assistants, volunteers, or substitutes. 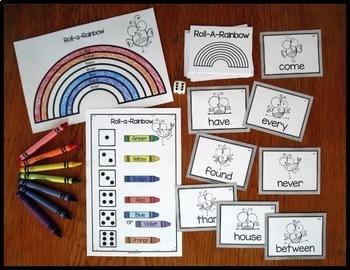 Read a word, roll a die, and build or color part of a rainbow. This resource was crafted by Judy, a teacher with a master’s degree and more than 35 years of teaching experience. ★Look for the green star next to my store logo and click it to become a follower. You will now receive email updates about new resources and discounts. New resources are often 50% off for the first 48 hours! Please provide constructive feedback for this resource. My goal is to create quality instructional resources that you are able to use in your classroom. Please go to your My Purchases page. Beside each purchase you'll see a Provide Feedback button. Simply click it and you will be taken to a page where you can give a quick rating and leave a short comment for the resource. Each time you give feedback, TPT gives you feedback credits that you use to lower the cost of your future purchases.